Dolls are not my favourite things. In fact, when I was a kid I hated them. One particular episode of Friday the 13th cemented it - dolls were just downright scary. 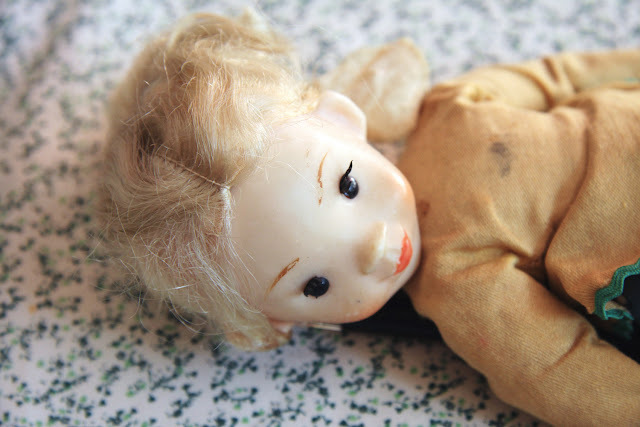 However, when I found this doll in the bottom of a box at my favourite second-hand shop in the Jordaan, I thought she was just too sweet to leave lying there. For only 50 cents, I bought her and intended to fix her up one day. That was a year or so ago. I've just rediscovered her lying in a box under the bookcase and now I have a good reason to mend her.